I mean really. Who doesn’t like fried rice? Ok maybe my six-year-old doesn’t because of the veggies inside, but I am pretty sure he is the only one out there. For my birthday dinner with my family, I chose to go to our favorite little Chinese restaurant. And it was the bomb. But their fried rice was excellent. But I kept thinking, I can make this just as good at home and I have been craving it ever since! Since I learned a few awesome tricks on how to get the perfect fried rice in my recipe here, I wanted to make a big old batch for myself for lunch. The baby was craving it that day. But I thought, why don’t I add in some protein and make a meal out of it. You guys. The chicken gave it such amazing flavor! I really couldn’t believe how good it turned out. I promise that you can stay at home and have this better than take out chicken fried rice. You will really be impressed with yourself. Easy Chicken and Vegetable Fried Rice is so simple to make at home, and is way better, healthier and cheaper than take-out! 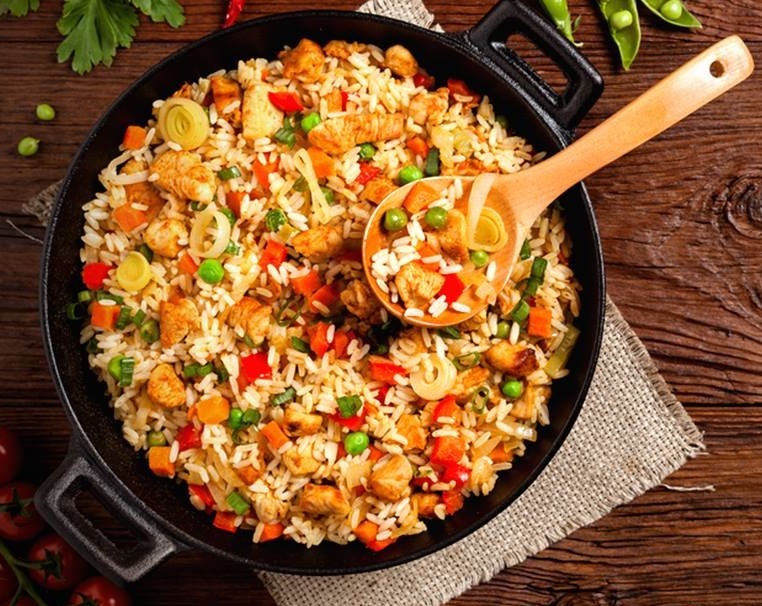 Week days were made for a light and hearty recipes like this simple chicken and vegetable fried rice. 1. Heat the cooking oil in a large frying pan. Add the chicken pieces, season with salt and pepper, and fry for about 5 minutes or until browned on the outside. Place the chicken on a plate and set aside. 2. Add the onions and saute until softened. Add the garlic and fry for a few seconds. Add the peas, bell pepper, and carrots. Stir fry until tender. 3. Lower the heat to medium-low and push the mixture off to one side. Pour eggs on the other side of the pan. Stir fry until scrambled. 4. Now add the rice and soy sauce and blend all together well. Stir in cooked chicken and cook until mixture is heated through. Serve and enjoy!